SHEERWATER got back to winning ways in the league after coming out on top in a six-goal thriller against Fleet Spurs on Saturday. The Sheers returned from two consecutive defeats to net four times for the first time since September, as they edged out Spurs 4-2 at The Laithwaite Community Stadium. 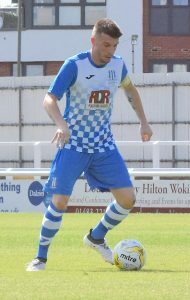 After dropping points away to Sandhurst Town the previous week, Sheers’ boss Pete Ruggles made two changes to the starting XI, with new signing Danny Taylor – the third of the Taylor brothers – the most notable addition to the side after defecting from Abbey Rangers. The visitors took the lead against the run of play after 24 minutes. However, Shane Rideout hit two goals with Danny Taylor adding a third before half-time to ensure the hosts were in control. Rideout completed his hat-trick early in the second half, with Spurs only able to grab a consolation goal. Speaking to the News & Mail after the match, Ruggles said: “It’s a pleasing win; yes, we could’ve done better and pushed on, but we got the three points. “It’s great to see more options coming back, hopefully it’s the start of a good run,” he added.